By looking at the world's problems through a trauma-informed lens, community restores hope, one life at a time. GSN incorporates limited-resource methods, building upon the cultural practices and traditions of the areas where our interventions are implemented. Our materials have been adapted for Kenya, Somalia and Ethiopia by using local folk tales, case studies and artwork. Our organization brings together professionals and experts in the fields of peace-building, trauma-informed healing and sustainable economic development. We have decades of collective experience working at the community level supporting social transformation and healing. We research the communities we serve to better understand their contexts and to monitor and evaluate the impact of our programs. Our team is collecting data in under-researched, hard-to-reach areas where the experiences of these populations highlight the importance of trauma as a critical variable to conflict transformation. Our post-intervention findings show positive changes in attitudes, with decreases in levels of distress and post-traumatic stress symptoms. When entire generations have lived through protracted violence and existed in survival mode for decades, the cracks in society are entrenched. These cracks can be entrenched and reflected in normal daily life. They not only impact individuals, but also the systems and structures that are meant to support recovery. By supporting trauma-informed approaches, intractable becomes possible through tapping into the knowledge, skills and values of local communities. Green String Network (GSN) is continually building partnerships with community-based organizations to help support local efforts toward social healing and community resiliency. Imagine that your community and or society is like a cup of water, and the water poured in represents NGOs, donor programs and government initiatives that pour aid and resources into our communities. After a while we no longer see the CUP - only the wasted resources spilling over. The majority of aid organizations looks at what is being put into the communities; they are pouring in "water" without knowing or understanding the cracks in communities, the challenges and the resources that already exist within the communities. Is water (additional resources) causing even more harm? But if a cup (community) undergoes a healing process (repairing the cracks), it can hold what is being put in! - And in the best-case scenario, with the right resources chosen and accepted by the community, communities are able to dig their own wells to supply their own water. 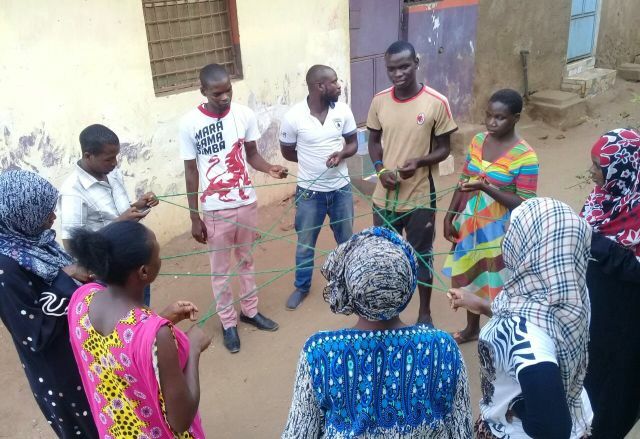 In other words, with the right resources and capacities, communities can empower themselves and find solutions to seemingly intractable problems! Thanks to our friends and partners at Fambul Tok, Sierra Leone and Catalyst for Peace (USA) for the Inside-Out Framework of Peace and Development and the cup analogy.